E. Ahamed Kerala member of parliament (MP) profile and biography is given here. 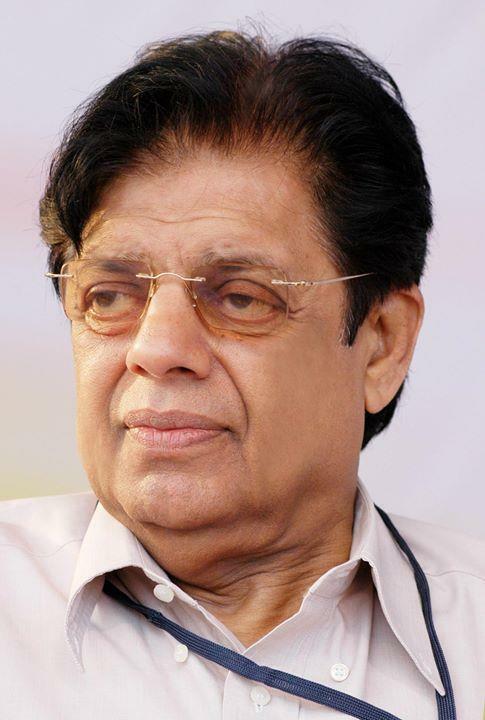 E. Ahamed is the first Muslim leader from Kerala who has consistently fought and won elections to the Parliament and Kerala Legislative Assembly. He was the Minister of Industries in the Kerala Government from 1982 to 1987. He was regarded as one of the leaders who have contributed to the development and branding of the Indian Union Muslim League in Kerala. This article throws some light on the life and works of this leader. E. Ahamed is a Muslim leader from the state of Kerala. He belongs to the Indian Union Muslim League (IUML), which has stronger performance in parts of the Malabar area in northern region of Kerala. He is currently a Member of Lok Sabha, representing Malappuram Constituency in Kerala. He is also a Minister of State for External Affairs. He is also the President of the All India Committee of the IUML. Previously, he was a Member of Kerala Legislative Assembly for a period of 24 years from 1967 to 1991. He was also a Member of several high-level governmental delegations and Parliamentary Committees. E. Ahamed was born on April 29, 1938 in a remote village hamlet in the northern district of Kannur in the state of Kerala. His parents were Abdul Khader Haji and Nafeesa Beevi. At a very early age, he was initiated into the world of letters by his parents. Later he was put in a local school to enable him to have formal education. After the completion of the formal education, he was enrolled in a reputed school so that he could continue his education up to the tenth standard. Early during his high school days, he was more focused on his studies. In the later part of his high school days, he started taking interest in things that happen around him. In fact, he started participating in the political movements that aim at improving the lives of students. Despite these small time participations, he found enough time to study to equip well to write the crucial SSLC examination. Due to his preparedness, he was able to crack the exam well and secure good marks and grades. Subsequently, E. Ahamed joined a local junior college to take up a pre-degree course. He took up the arts stream to complete this course. By now, he had started participating in various political events happening in his vicinity. During this time, he started sailing ideologically with the Indian Union Muslim League. In fact, his father was a sympathizer of the IUML. Following his father's footstep, he soon joined IUML as a full time member. At that point in time, IUML was in its infancy and was spearheading agitations and movements to bring the benefits the Muslim community deserves. With the political image and a safe bet on education in mind, he devoted his time between both judiciously. As a result of this, he continued to participate in various political events and put the rest of the time for his academic studies. This enabled him to do well in the pre-degree examination. When the results of the pre-degree examination were made public, he found himself in the list of winning candidates. Emboldened with the success in the pre-degree examinations despite his participations in various political events, he joined the Government Brennen College in Tellichery to undertake a degree course. There also he continued to employ the similar trick and built his political image carefully. Since his preparation was adequate, he wrote the degree examinations well and came out with flying colors. LA few years later, he joined the Government Law College, Thiruvananthapuram, to take up his LLB course, as he wanted to become a successful lawyer. He thought that this professional degree would keep in good stead in the field of politics in the state. Before getting a breakthrough in politics, he started his career as a practicing Lawyer. Mr. Ahamed was a Member of the Kerala Legislative Assembly consecutively for 5 terms from 1967 to 1991. From 1982 to 1987 he was a Minister in State Cabinet in charge of the Department of Industry. He was elected to the Lower House of Parliament for the first time in 1991. He has won all the subsequent elections to the Lok Sabha till date. Ahamed is representing the Malappuram constituency in the current Lok Sabha. He was a member of several Parliamentary Committees and delegations during this period. He represented the country in the UN General Assembly from 1992 to 1997. For four years, he was the Union Minister of State in charge of the Ministry of External Affairs in the first UPA government. In the second UPA government, Ahamed was the Minister of state for railway affairs. After one year, the Prime Minister decided to move Ahamed to the Ministry of External Affairs. While practicing as an Advocate, he got married to Zuhara Ahamed. The couple had two sons and a daughter in their marriage. After several years of successful married life, Ahamed had to deal with his personal loss when his wife died of age-related disease. E. Ahamed has a long and illustrious career as a political player in the state. He joined the political bandwagon as a student to face the political adversities that were plaguing in the state of Kerala. In a way, he was also involved in the setting up of the full-blown IUML party in Northern Kerala. He also was part of a panel that extensively traveled to various parts of Northern Kerala to spread the awareness about the ideologies of the Muslim League. Under his able guidance, the party systematically campaigned for the welfare of the Muslim brothers from different parts of Kerala. This enabled the party to create a community-friendly image for the party. The party is able to maintain this pro-Muslim image even now to garner the support for its candidates at the time of elections, be them Parliamentary elections for Legislative Assembly elections. This helped him to gain the maneuvering space for him in the party. Since he worked with the party workers to make the party strong in Northern Kerala, he was an acceptable figure amongst the rank and file of the party. E. Ahamed's closeness with the people and popularity as the leader enabled him to get a party ticket for contesting the general election in the state. So, for the first time in the year 1967, he was elected as a member of the Kerala Legislative Assembly for a period of five years. Since then, he had won four more elections to the state assembly consecutively, representing Malappuram constituency. During his term as the Kerala Legislative Assembly Member, he even joined the state government cabinet as a Minister in the year 1982. From that year, he was the Minister in charge of Industries in the state government for a period of 5 years. After the tenure as the state Minister, he came back to the party and headed various party panels and committees till the year 2001. In the year 2001, he was elected as a member of the Parliament. His growing stature as a party leader enabled him to bag the role of a permanent MP from Kerala state to address the needs of the Muslims. E. Ahamed has traveled widely throughout his career and started holding some important positions while he was on the permanent role of an MP from Kerala. He tried to raise the voice of the people in general and Muslim in particular across all the fora and meetings. As an esteemed Member of Parliament, he traveled to the foreign countries and tried to bring home the successful governance practices from there for the benefit of people in the state. Currently, he is the Union Minister of State in charge of the Ministry of External Affairs. He is also responsible for the establishment of Kerala State Rural Development Board. He has seen many challenges as the only permanent member of the Consultative Committee on Ministry of External Affairs ever since 1993. E. Ahamed has occupied different posts during his long and illustrious career as a Politician and Social Activist. He occupied both constitutional and private positions. When he was not with the government formation, he took up the posts offered by the party and did his job well. He was the Chairman of Kannur Municipal Council in the year 1981. In the year 1987, after resigning as the state Minister, he took up the job of heading the State Committee on Government Assurances in Kerala Legislative Assembly. After becoming the Member of Parliament, he became an honorable Member of Committees on Subordinate Legislation, Public Undertakings, Railways, Environment and Forests, Science and Technology, and Provision of Computers to Members of Parliament. Since 1993, he has been the Special Permanent Member of Consultative Committee that looks after the Ministry of External Affairs. He was also a privileged Member of a Consultative Committee on Ministry of Civil Aviation and Tourism. As a Senior Parliamentarian, he was appointed as the Chairman of Committees that deliberated on Absence of Members from the Sittings of the House, Government Assurances, and Food Management in Parliamentary House Complex. At the state level, he was selected repeatedly as the General Secretary of Indian Union Muslim League. Being a voracious reader, he has read books on various topics. He took time in between his busy schedules as a Politician and wrote three books. One book titled One Foreign Journey and Numerous Memories describes the experiences of a man who travels to a foreign destination for the first time. The second book titled A Story of Renaissance of Indian Muslims talks about a Muslim Leader who has personally seen the slow rising of Muslim strength in Kerala. The third book return by him was The Leaders I know. This book was written in Malayalam. Being a man of letters, he was included in the director board of Chandrika, the Mouthpiece of Indian Union Muslim League. He has put several of his productive years as a writer in Chandrika, the newspaper published by IUML. Taking into consideration his productive works, he was made the Executive Director of Chandrika. During the leisure time, E. Ahamed has worked for several educational, cultural and social institutions. He has given his valuable inputs to these organizations to fulfill their social obligations. Other pastime activities for him are reading, writing and listening to soothing music. He is also a sports enthusiast. He has played football and cricket during his younger days. He loves to watch the football and cricket matches lively streaming on the television screens. He takes special interest in the promotion and establishment of schools and other educational institutions for the benefit of mankind. E. Ahamed is a seasoned Politician and Social Activist from Kerala. He has over 30 years of experience in political activity. He is considered as one of the leaders who have brought up the Indian Union Muslim League as a political force in the state. He toiled hard to along with other senior functionaries of the party to establish the pro-Muslim image for the party. Due to his close association with the rank and file of the party at the grass root level, he was able to extract the political mileage for himself while new positions are being created and filled in the party. Using his clout in the party, he was able to get the party tickets for contesting the state-level and national-level elections. He not only got the tickets but also successfully fought the elections to become the Member of both Parliament and Kerala Legislative Assembly. As a senior Member of Parliament, he was Special Permanent Member of a Committee on Ministry of External Affairs and looked after the issues relating to the Indians working in Gulf countries.